The digital disruptors that changed the world don’t look too much alike. Amazon is a warehousing giant with an internet delivery arm. Expedia is an online travel agent. Ebay is an auction house at your desk. Were the three companies siblings, they’d take after three different grandparents. Yet they are more similar than they appear. What unites them is that they are all incredibly quick at turning a profit. In the spring, we released our inaugural Financial Cycle Time (FCT) rankings. Many of those that won medals for their rapid FCT were disruptors: giants of the world economy that have completely reshaped the landscapes of their industries. Recap: What is Financial Cycle Time? Imagine that two companies in the same industry with very similar market focuses and financials generate a profit margin of 8%. But the first company makes that margin every 365 days compared to the second company’s cycle time of 183 days. Annually, that translates to 16 cents of cash for investors compared with eight cents of cash for the slower company. The more productive and efficient company wins financially. You can use the formula to measure your company’s cycle time. Take total invested capital and divide it by annual revenue. That tells you the percentage of the year that you are tying up capital. Then multiply by 365 to translate the metric into days. The result tells you how often, on average, it takes to turn invested capital into revenue. Disruption is not driven by profitability, it is driven by productivity. Walmart – once one of the greatest disruptors on the planet, with its efficient supply chain and world-class point-of-sale data-relay – has itself been disrupted. The interloper? Amazon. It has achieved a quantum leap in productivity. The internet retailer boasts a financial cycle time of 30 days – less than half that of Walmart’s 88. Yet if Walmart has no answer for Amazon, then Macy’s – once the kingpin of American shopping – is struggling even to grasp the question. Its financial cycle time of 122 days is streets behind. It is losing revenue dollar-for-dollar to Amazon, with the latter’s next day – sometimes same day – shipping and free returns policy. Macy’s runs product through its stores every 122 days, while Walmart is doing it in 88 days. Enter Amazon – it completes the cycle in a month. If one company can do things much quicker than its rival, it doesn’t matter greatly what its profit margins are. Across the retail industry, companies are trying to reduce their cycle time so they can compete. Macy’s challenge is that many of its suppliers also have long financial cycle times, hence why it is particularly vulnerable to disruption. The better news is that its suppliers have a great deal more flexibility than their major client does. Macy’s holds much of its product in its vast inventory, meaning it is much harder for it to improve its FCT. Macy’s is a classic Main Street big-inventory company. Of course, that gives it a few advantages – its large stocks can help customers who need to buy things quickly or on impulse. At least until same-day delivery becomes widespread, which is a long way off, there will remain a place in the economy for downtown retail. Yet what of companies outside the sector that carry giant stocks? Take Airbus, an aircraft manufacturer that makes planes without having an immediate customer. We remember driving past Airbus’s plant and seeing several $80m aircraft sitting in its hanger waiting for customers. The key to productivity is to have your customers lined up in advance. Look at our winners’ league. What stands out? Anyone with even a basic knowledge of statistics will spot that many of our highest-ranked productivity champions posted negative cycle times. So how do they do it? By having their orders prepaid. Consider Netflix. The gold-medal-winning internet video streaming service sells you monthly subscriptions before you watch its shows. Therefore, it has a negative financial cycle time. There are other examples. Whenever Apple releases a new iteration of the iPhone, it already has millions of orders lined up and prepaid. Its hardware supplier, Foxconn, holds most of its inventory. Apple’s hyper-efficient supply chain is one reason why it is by far the world’s most valuable company. The defence sector – which boasts lots of ultra-reliable government clients who pay their bills upfront – holds some of the fastest FCTs anywhere in the rankings. Our three medallists – Thales, BAE Systems and Bombardier – all possess negative FCTswhich all benefit from customer advances. The software industry, too, is another sector that is happily familiar with negative FCT. Value creation for firms is about exceeding investor expectations. Stock prices are built on the expectation of future returns for investors, who demand sufficient returns to compensate them for the risk they bear. Exceeding these expectations is a challenge for any firm. For exceptional returns, choose investments that generate returns that beat investors’ expectations by achieving profitable growth; that is growth where the expected Return on Invested Capital (ROIC) exceeds the risk expectations of investors. Take, for example, Amazon’s acquisition of Whole Foods. 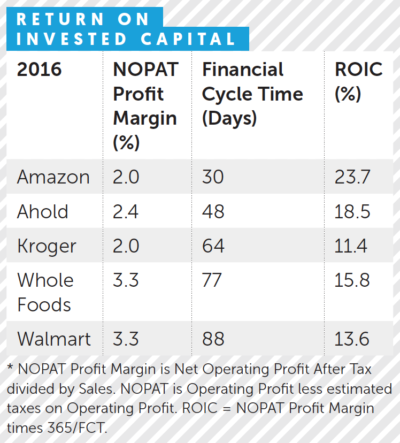 A key value driver for this merger will be the improved ROIC that Whole Foods is expected to achieve by leveraging the productivity that Amazon brings to the generally low-margin grocery business. 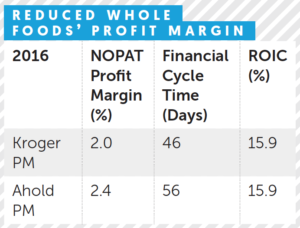 Traditionally, Whole Foods commanded a significant premium with its higher-quality products and prime locations, generating margins of 5-7% while other grocery stores made less than 4%. But Whole Foods’ growth has stalled and the perception among many consumers has been that prices are quite high, prompting the frequently used nickname ‘Whole Paycheck’ to describe the firm. What if Amazon could transform Whole Foods’ productivity and lower prices? ROIC is defined as Profit Margin x Productivity. 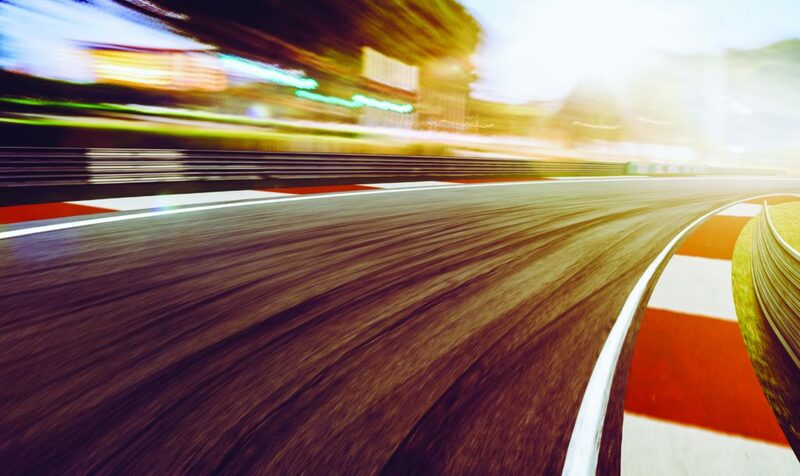 As we discussed in our article, The Need for Speed, www.dukece.com/insights/the-need-for-speed/, a key metric that captures a firm’s productivity is Financial Cycle Time (FCT). As you can see above, Whole Foods is not very efficient in terms of FCT relative to its peers, while Amazon is substantially more productive. Investors asked themselves, what if Amazon was able to transform Whole Foods’ productivity to be closer to its own? The market’s initial reaction to the announcement of the acquisition was quite telling. While Amazon’s stock price was up about 2.5%, Walmart’s stock price dropped by almost 5%, and Kroger’s stock price dropped by about 9%. Even non-US grocers saw their stock prices drop. Ahold Delhaize, a Dutch grocer with US operations, dropped 10% on announcement day, while Woolworths, an Australian-based chain, dropped 3.5%, and Tesco, a British grocery firm, dropped 5%. However, we would expect through operational improvements that Amazon would find a way to decrease FCTime for Whole Foods even further. Cutting FCT to Amazon’s phenomenal 30 days, would yield a stellar ROIC of 41%. Some may be concerned that operating margins for Whole Foods might be squeezed even more as Amazon takes control of its operations. 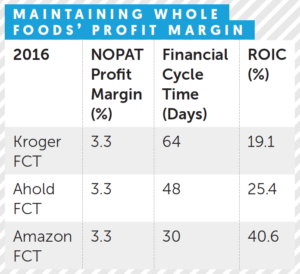 Even if Whole Foods’ performance fell to Ahold’s 2.4% operating margin, it would only take a FCT of 56 days to maintain Whole Foods’ ROIC of just under 16%. We would anticipate that Amazon can do a better job than 56 days. A full list of winners is listed above. Well done to them all. 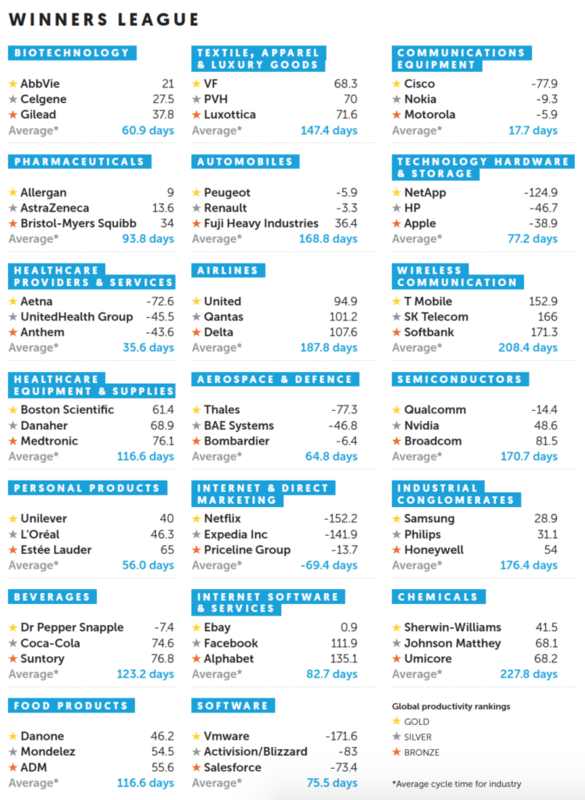 These are companies that have recognized that productivity is the new profitability, and acted on it. It is the companies which can turn over their profits quickest that will succeed in this fast-moving world. Yet those that remain just outside the rankings have a great deal to be optimistic about. Perhaps next year they will break into the medal places. It’s a fluid picture. Things can change quickly in 12 months. Good luck!